Birdcage Veils were a bridal trend in the 1940s , often adorned with millinery, and they have been making a comeback. They are small and gather up mostly around the face. 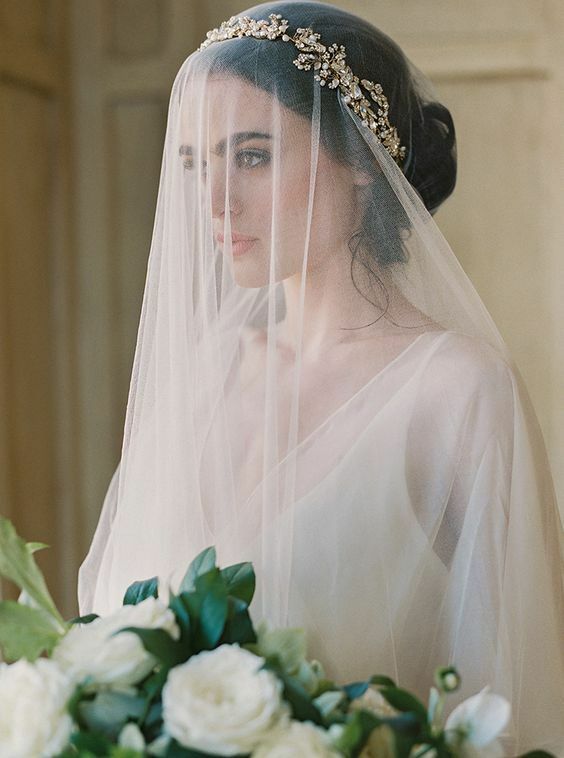 Instead of a solid piece of sheer fabric, birdcage veils are typically netted. Add a flower or a feather to the veil to complete the look. Cathedral Veil The cathedral veil is big and bold and fit for a queen. They are so big that you and your partner can canoodle and kiss inside one. Could make for a memorable photo! Another amazing photo could be you walking up to a real cathedral with your gorgeous veil cascading behind you. You can further fancy these up by getting one with lace or floral patterns. Chapel Length Veil The chapel length is long and flowy. But, it’s not as long as the cathedral. If you want go long but not TOO long this may be your best choice. It’s elegant and you’ll be a little less likely to trip over it. Swarovski Crystals Veil If you want to dazzle, consider Swarovski crystals on your veil. They can be placed randomly on the veil to mimic stars in the sky or in strategic patterns. It’s a great way to add sparkle to any size veil. Mantilla Veil This veil’s origins are from 16th century Spain. It’s a traditional Spanish veil worn over the head and shoulders and its shape differs from the traditional American veil. They possess timeless sophistication. Veil with Blusher The blusher is the part of the veil that covers the face. Back in more superstitious days, they were worn to protect against evil. They have also been used in the past to cover up a bride’s face so that a groom can’t see her before they are properly wed. But nowadays, most brides just wear them because they look cool. It’s like an automatic soft filter over your face! Flattering and very bridal. Tiara Veil Can’t decide between a tiara or a veil? I say rock both! This is your day. You can rock both, as two separate pieces. The top of your head will sparkle and you’ll also have fabric flowing around you. Or, you can wear a piece that incorporates both. 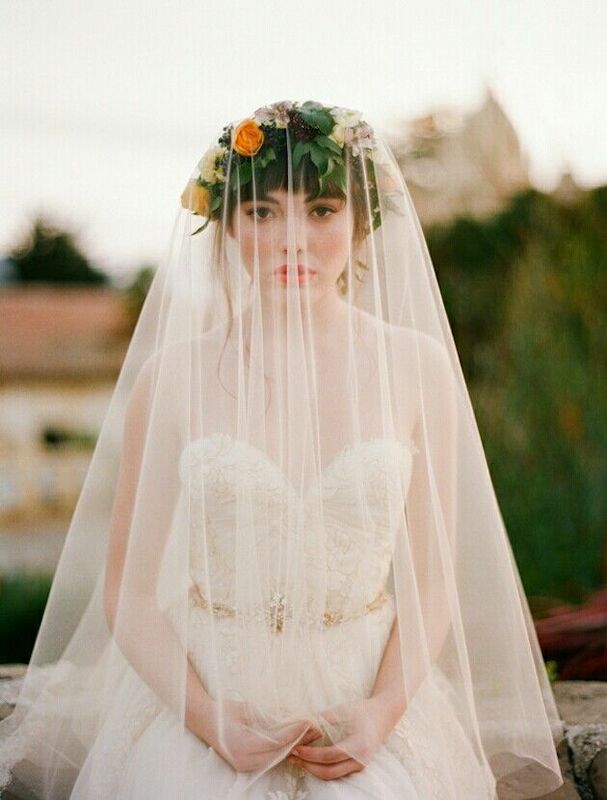 A veil that is attached to a tiara is fitting for your inner queen. Drop Veil A drop veil is a type of blusher but there is no separation between the blusher and the veil. Rather, it’s one single piece of tulle that is placed over the bride’s head. It will drape over your head with no volume. It’s simple but can be jazzed up with embellishments and pins. Kate Middleton wore a drop veil for her wedding. Veil Flower Crown Perfect for the wild child brides who prefer flowers over tiaras. The veil can flow from behind your flower crown. This look would go well at a rustic outdoorsy wedding. I hope that I helped you learn a bit more about all the veils out there. If you'd like to custom order a veil from NK Bride I would love to hear your ideas and work with you!